Once again, State Senator Glenn Grothman, the asocial Teapublican from West Bend, has put his foot into it. Wisconsin manufacturing and retail workers could volunteer to work seven days straight without a day off under a bill two Republican lawmakers are circulating on behalf of the state’s largest business group. The bill promises to ratchet up tensions between the GOP and Democrats and their organized labor allies, who are still stinging after Republicans passed Gov. Scott Walker’s plan to strip most public workers of nearly all their union rights in 2011. The measure’s authors, Sen. Glenn Grothman of West Bend and Rep. Mark Born of Beaver Dam, say the bill brings Wisconsin in line with federal law, gives workers a way to make extra money and employers a way to boost production. But Democrats and labor leaders insisted bosses would use the bill to force their employees to work longer and effectively erase the weekend. “Even God said rest on the seventh day,” said David Reardon, secretary-treasurer for Teamsters Local 662, a union that represents about 10,000 workers across various industries in west-central and east-central Wisconsin, including manufacturing, transportation, government and food service. “I would hate to see that Republican bill pass. Some employers would really take advantage of that,” Reardon said. Current Wisconsin law requires employers who own or operate factories or stores to give workers at least 24 consecutive hours off every seven days. Under Grothman and Born’s proposal, workers could volunteer to work seven straight days without a rest day. In an email to lawmakers seeking support for the bill, Born and Grothman said they had heard from businesses with employees who want to work the additional time. But when asked for names, Born said the only people he met with to discuss the bill were from WMC. “We should have worded that differently,” Born said. Grothman said he has talked to a business but declined to name it. WMC spokesman Jim Pugh didn’t return messages. Born said the bill gives workers a chance to make some extra dollars and their bosses a means to increase production. But opponents warned the only choice employees will have is work the extra hours or lose their jobs. The measure also would give workers who can work the extra day an advantage over workers who want to spend a day with their family, they said. Now, if they were really interested in allowing the employees to earn more money, they would jump on board with the Democrats' proposal to raise the minimum wage in the state (although what they are proposing still isn't high enough, it's a start). Imagine, being able to make more money and still get to spend time with your family - what an unique concept! And if the employers want to increase productivity, they could do it the old fashioned way - by hiring more workers. Yes, I do realize that would mean actual job creation instead of the lip service version that the Teapublicans are spewing now. It is rather telling that such simple solutions to the problems facing the state is still beyond the grasp of these corporate puppets. Grothman dismissed their concerns, saying he’s never heard of any business where pressuring employees to work extra hours has been a problem. He, too, insisted the bill would help workers make extra cash. It's rather mind-boggling in its hypocrisy, isn't it? It's not surprising though, that Grothman hasn't heard of any businesses trying to screw their workers. Heck, he hasn't even heard of any African Americans that celebrate Kwanzaa either. Related: Glenn Grothman hates that you get Martin Luther King Day off too. I'd love to know if either of these idiots ever had to work a 7 day week. I'd be willing to bet that neither of them worked at a job where they didn't find out until Thursday, that they would be working Saturday, screwing any plans they had made for the weekend. Getting sick and tired of these corporate whores dictating policy that will never ever affect them. The other obvious consequence will be that a business can lay off employees if some "choose" to work an extra day. Guess who wins in that scenario? Perhaps Sen. Grothman should like to be called Lord Grothman and rule instead of serve. Grothman works approx 100 days per year sucking the public teat. He still lives in his Mommy's basement as well. Glenn Grothman should not have a job representing constituents. He is free loading and double dipping by taking taxpayer supported salary and benefits while ignoring his constituents and taking private sector money in exchange for bills like this. 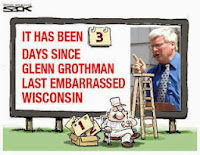 It is disgusting, vile and morally bankrupt men like Grothman who are destroying our state and our Nation. 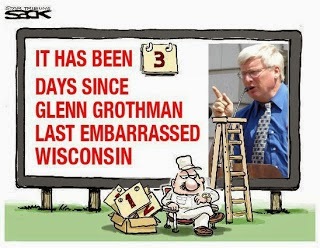 Vote Grothman out. We, the people, are HIS EMPLOYERS, and he is incompetent just like his colleague Joel K. GROTHMAN YOU NEED TO BE FIRED!